I have looked in all my books to find the name of this pattern, and it's not in there. Any clues? This is so embarrassing, but the truth is that I can only help regarding antique Chinese Porcelain, i.e. hand painted potery or porcelains from the early 20th century and back to early Neolithic period, so this is off my turf so to speak. The modern Chinese porcelain factories have thousands of patterns and I can only begin to guess what this is called. The flower of the border seems to be a Chinese Tree Peony, though, and a pattern name would most probably be referring to this. 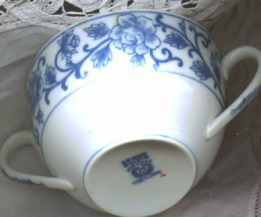 The porcelain was brought back from China in leaky old wooden ships. It was American Clippers and earlier than that, East Indiamen from Portugal, Holland, England and Sweden. To keep the expensive tea dry they needed something that could stand water to put in the bottom of the cargo hold and it was there the porcelain came in as a perfect merchandise. But, as the 18th century went along the potters and the traders invented more and more different shapes until we ended up with the 19th century dinner sets with literally hundreds of pieces with one special shape for every conceivable purpose. They even made trays to put under spoons. And that is where two handles came in. In the beginning there were no handles at all on the tea cups since the wise men of the East would not dream of drinking anything that was so hot that you could not even hold the cup with your fingers. But, there is a limit to how many plain "bowls" you need, so after first having invented the "dish" to put under the cup, they came up with the idea of putting one handle on some of the bowls, and decided that this was for coffee. Then, finally, by the basically Western notion that anything worth doing is worth overdoing we got cups with TWO handles, and decided that this is for chocolate - or as it seems from your email - for bullion. We do know from contemporary paintings that there was no such distinctions in the beginning - but there we are. Again, I am sorry not being able to help you with your real problem but as always, nice to chat.